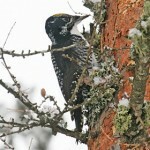 Description: Male has a black chin; yellowish throat; white cheeks and forehead; red cap; light eyes; black nape, back, wings, and tail; white belly; and heavy dark streaking on breast and flanks. 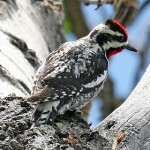 Female similar but with a smaller bill and less red on the crown. In flight, conspicuous white rump and small white patches on the outer wings are visible. 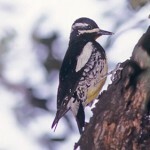 Habitat: Found in open oak and pine-oak forests where oak trees are abundant. Where in Nebraska: Accidental. One seen at a feeder in Holt County during May of 1996. Field Notes: Range appears to be expanding. 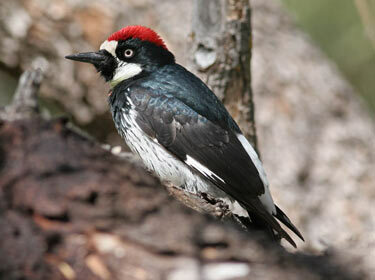 Fun Facts: The Acorn Woodpecker will use human-made structures to store acorns, drilling holes in fenceposts, utility poles, buildings and even automobile radiators.